Since our inception in 1974, our mission has been to strive for the humane treatment of all animals. From dogs and cats to horses and turtles, we believe every animal deserves a warm home and a loving owner on which they can rely. At the Humane Society of Morrow County, we believe that every time we save an animal, we succeed in helping to make the world a better place -- thanks to the help and caring of our local community. As a non-profit organization, we're only able to uphold our mission and commitment to the animals of Morrow County with the support and compassion of our members, pet fosters, volunteers and local community. With your help and caring, we can continue to save animals from abuse and neglect. If you're interested in adopting an animal, or would like to help foster a pet until that perfect match can be found, please contact us today. We don't have a shelter, but we always have many loving, healthy pets waiting in foster homes for their fur-ever family to adopt them. You don’t have to own a dog to be a dog lover. Or, maybe you love pictures of fuzzy wide-eyed kittens – even if you can’t get near them because of an allergy. Animal lovers, just like the pets we adore, come in all varieties and styles. And no matter what breed of animal lover you are, there are many ways for you to support the HSofMC. We provide as much outreach service to the community of Morrow County as possible, by providing pet food and medical services to those in need within the County. ​﻿Follow us on Facebook for lost & found, updates on adoptables, humane investigations, and upcoming events. for low-cost spay/neuter, assistance with pet food, medical costs and more. ﻿Thank you to all our corporate sponsors and members for their support. We could not do it without your generosity. Please consider giving your business to these generous people. 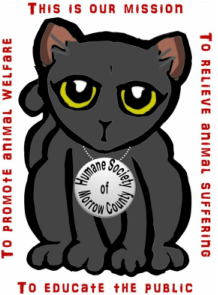 Tell 'em the Humane Society of Morrow County sent you!